By Kori ~ July 28th, 2010. 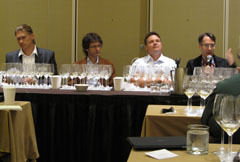 During the recent Riesling Rendezvous, one of my favorite sessions was the Ageability of Riesling workshop, which made a strong case for the age worthiness of Riesling. In fact, Riesling is probably the most age worthy of all white wine varieties. This workshop, moderated by Stuart Pigott, featured two wines from nine different producers, one from a fairly recent vintage and a comparable wine from an older vintage. Representatives from the featured wineries were on hand to discuss their wines as well as the ageability of Riesling in general. Right off the bat, Stuart noted that the workshop was deliberately not called â€œmatureâ€ Riesling. Mature is an elastic term, so he more accurately referred to all wines as â€œmaturingâ€ no matter whether they are young or old. Wines, just like people, are always in the process of maturing. The wines we tasted ranged from a 7-year span between vintages to a 62-year span. I was thrilled to have the opportunity to taste two Rieslings older than me, a 1973 and a 1946. Both wines showed remarkably well considering their age. I was especially impressed by the 1973, which was still quite crisp and bright. According to Frederick Frank of Dr. Konstantin Frank Winery, wines that have higher natural acidity and lower pH seem to have a good formula for aging gracefully. During the workshop, a lively discussion ensued involving the use of the words â€œpetrolâ€ or â€œkeroseneâ€ to describe Rieslings as they age. The winemakers would rather people not use those words, which can have a negative connotation. They prefer those aromas that come with age to be described as smokiness. With that said, as you will see from my notes below, I still get petrol aromas in some Rieslings, particularly ones with a bit of age. 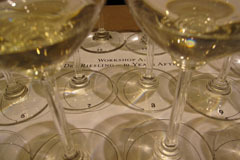 Rieslings, like all wines, change as they age. They tend to become sleeker and drier in taste. After tasting a wide range of Rieslings of different ages, it is clear to me that you either like older wines or you donâ€™t. When you are trying to decide when to drink a wine, it is important to know if you prefer wines young or with some age. It really comes down to personal preference. One way to determine your personal sweet spot is to buy a case of wine and drink it over time, taking notes on how the wine tastes, how it changes, and how you like it. Kori — Thanks for the very interesting post. I love Riesling, especially dry Riesling. Dr. Frank’s Vinifera Cellars is one of our favorite Finger Lakes wineries. I’m not into petrol or kerosene or old bandaids or the like. I do think it is amazing that a 64-yar old Kabinett Riesling can still be tart and crisp. Thanks, Dave. After the RR, I have a new appreciation for dry Riesling too. In general, I’m not fond of petrol, either, though it does seem to work in some wines. The maturing Rieslings really blew me away. Cheers!